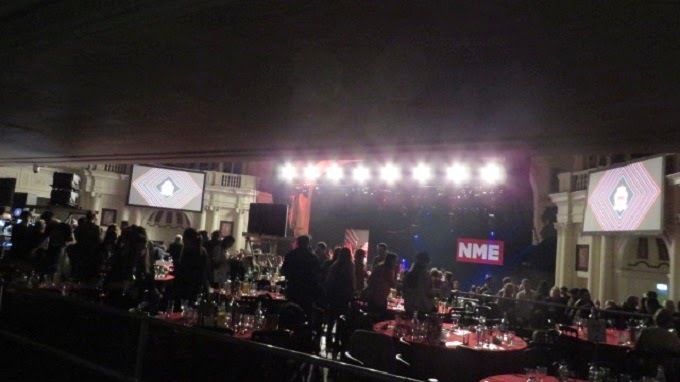 I had two weeks ago the chance to attend the NME Awards Show. I always wanted to be in the audience since I've heard the first time about but it unfortunately used to be an invite only event. Not this year, they put tickets for a public audience on sale and I was one of the lucky ones who got a ticket for the standing area. 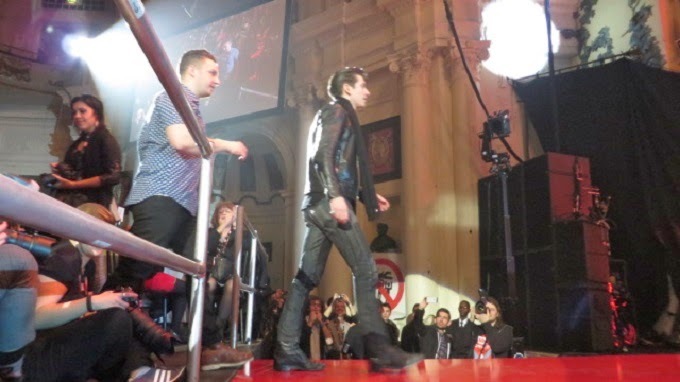 The NME awards show is an annual music awards show founded by the music magazine NME (New Musical Express). The ceremony is usually carried out in a humorous and jovial manner and the award includes beside the normal categories also categories like "Villain of the year" or "Worst Record". The award trophies resemble an extended middle finger. The audience usually consists of the biggest names in the music industry. Arctic Monkeys (Alex and Matt), Paul McCartney, Blondie, Alt-J, Johnny Marr (The Smiths, The Cribs), Haim, Disclosure, Carl Barat (The Libertines), Metronomy, Drenge, The Horrors, Swim Deep, Peace, Palma Violets, Eagulls, Chvrches, Damon Albarn (Blur), Brody Dalle (The Distillers), Jagwar Ma, The Lowe Sisters, Jerry Hall, Chloe Howl, and many more. The Arctic Monkeys dominated the Awards picking up five awards including three of the biggest awards of the night: Best British Band, Best Live Band and Best Album. 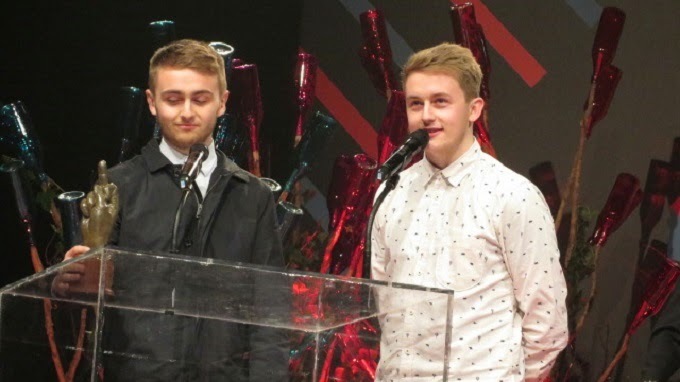 Other big winners included Sir Paul McCartney, Damon Albarn, Belle & Sebastian, Disclosure, Lily Allen and Haim. You can find a list with all winners HERE. I went there quite early as I was really excited to see what's gonna happen and also wanted to get a glance of the red carpet. Surprisingly there weren't as many people as I thought and the red carpet was tiny and just an open space so that literally everyone passing by on the street got a glance of it - completely different than it seems in the magazines. Well okay it's just the "entrance red carpet" and it continues within the building. What quite surprised me was the fact, that it seemed like lots of bands just arrived by tube. Really liked that tho. I got quite bored of the red carpet after a while so decided to finally enter the Brixton Academy. In the corridor the red carpet continued. This time the real, main one where all the journalists and photographer where positioned and all the pictures for the magazines arise. It was really interesting to watch the happening. I had to walk past the red carpet to get into the concert hall and got a glance of for example Blondie getting interviewed. 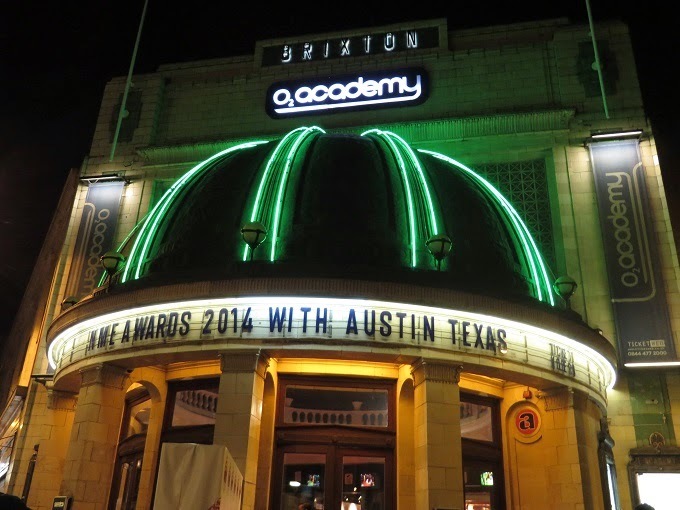 I've been to lots of gigs at O2 Brixton and quite like the venue, as it always feels a bit like an open air. Well back to the NMEs. I was really surprised to see how they transformed the academy into a proper awards show venue. In the middle of the room was a huge stage with tables on it for the guests (not to forget hell of a lot of booze aswell) and around it was space for the public audience. I found a really nice place between the main stage and the tables right next to the runway where the winners had to walk along to get their award. The show was presented by Huw Stephen. The whole event started with a performance by Metronomy together with MKS (previous called Sugarbabes) and continued with performances by The Horrors, Belle & Sebastian (including a stage invasion by fans), Drenge and of course godlike genius Blondie. The award ceremony took place between the acts. 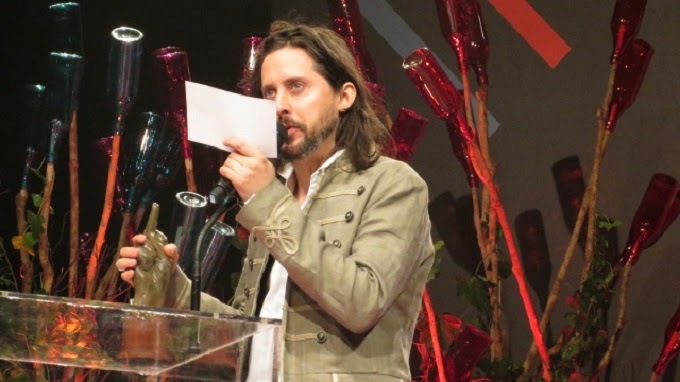 Every award came with a short introduction of the nominated bands and got presented by different celebrities for example Lilly Allen for the category "Godlike Genius". 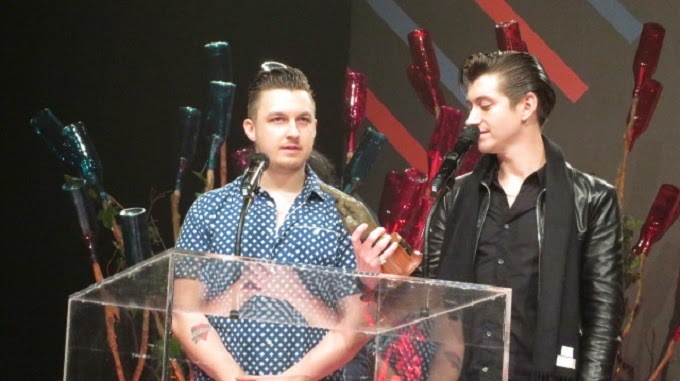 My highlights of the night were the Arctic Monkeys collecting their awards accompanied with some humorous speeches. 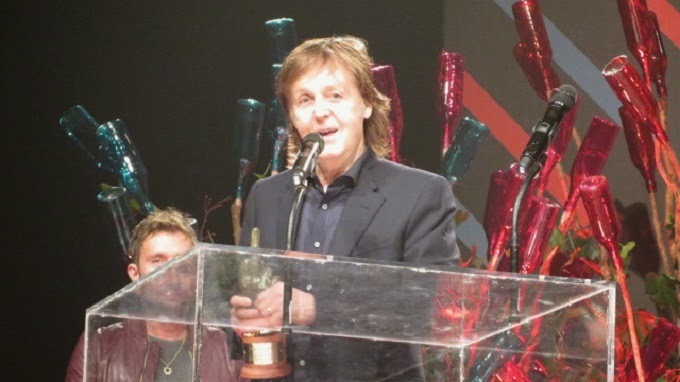 Sir Paul McCartney collecting his Songwriter's Songwriter award with standing ovation by the audience and a speech about how NME influenced his career and how John Lennon and he tried to sneak false stories into NME. 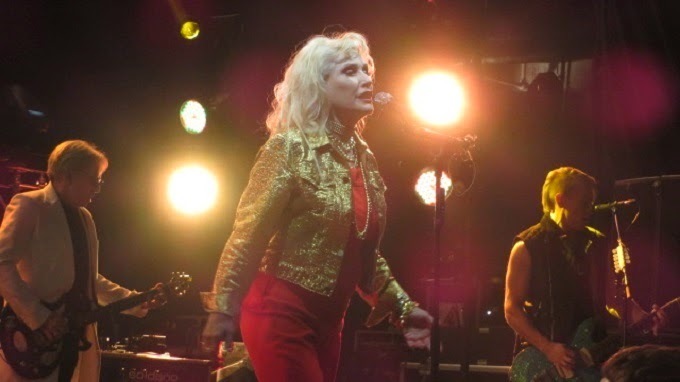 And finally Blondie performing and covering The Beastie Boys "(You Gotta) Fight For Your Right (To Party!). 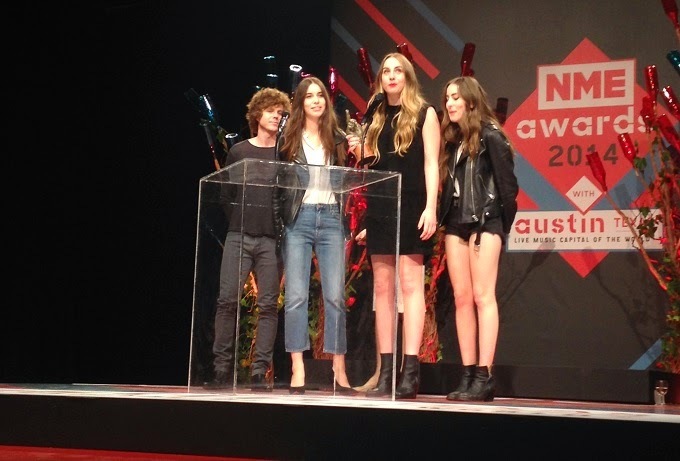 It was a really great experience and I for sure gonna try to get a ticket for next years NME awards show. Although you don't know who's gonna come and play when you buy the ticket you can be sure that it will be a good night. And sorry for the quality of the pictures but I just had my digital camera with me although I realized later that people were allowed in with their DLR's.